View to the east from the rim of Hole-in- the-Ground. The walls of the sinkhole expose bedrock of the Ely Limestone. Hole-in-the-Ground is just that, a sinkhole created by the roof collapse of a buried limestone cavern. It is massive. A hole that measures over 250 feet wide and up to 110 feet deep on an otherwise flat valley floor is an impressive sight to see. North-south-trending mountain ranges separated by broad and flat valleys characterize the Basin and Range physiographic province, which extends from the Wasatch Range across western Utah and westward to the Sierra Nevada in California. 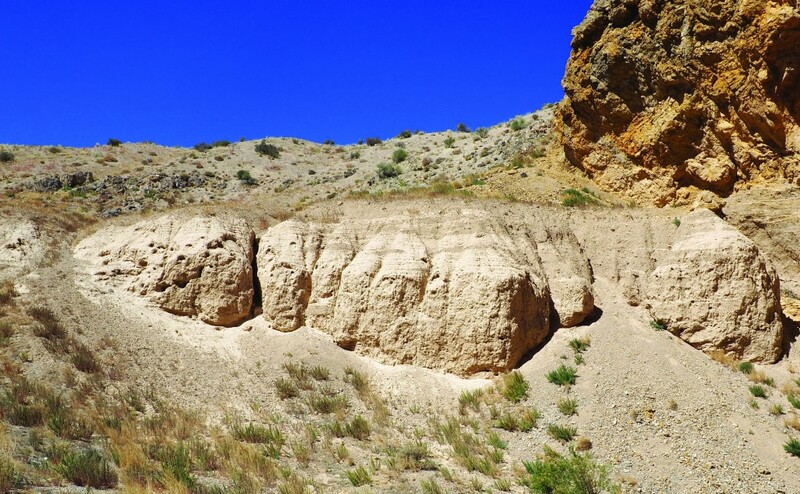 The valleys typically contain thousands of feet of sediment shed from their bounding ranges. However, this sediment does not always have a consistent thickness across a valley. Some locations have seemingly isolated rock outcrops of low-lying hills away from a range front. Nonetheless, when standing on a valley floor you tend to assume solid rock lies a great distance below your feet. 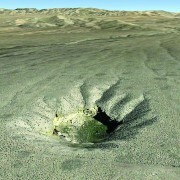 Hole-in-the-Ground creates a portal into the subsurface that shows these assumptions and generalizations can be wrong. 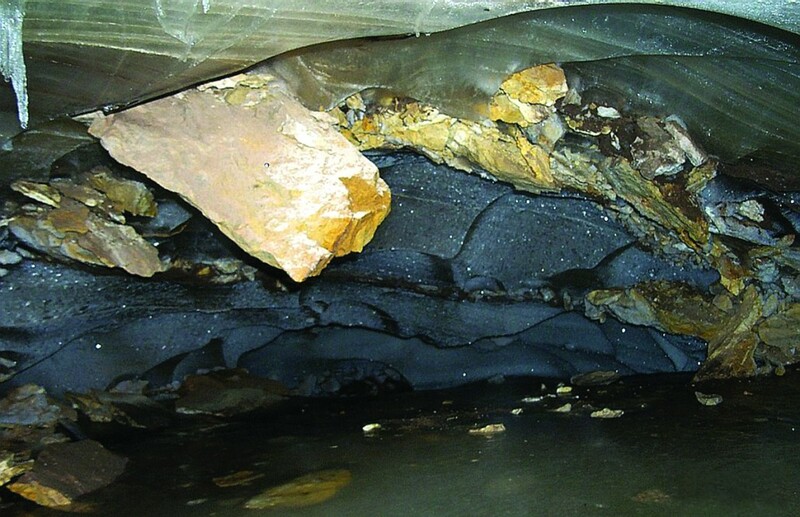 The walls of this sinkhole expose approximately 320-million-year-old (Mississippian- to Pennsylvanian-age) bedrock of the Ely Limestone a mere 30 to 40 feet below the surface. A buried fault is thought to have elevated the shallow bedrock. Sinkholes form by dissolution of underlying limestone bedrock, a process in which acidic groundwater dissolves part of the limestone and carries it away in solution. This creates a cavity which can continue to grow until the roof is unable to support its own weight and that of the overlying sediment. The collapse may occur as a single catastrophic event or a progressive series of smaller failures. 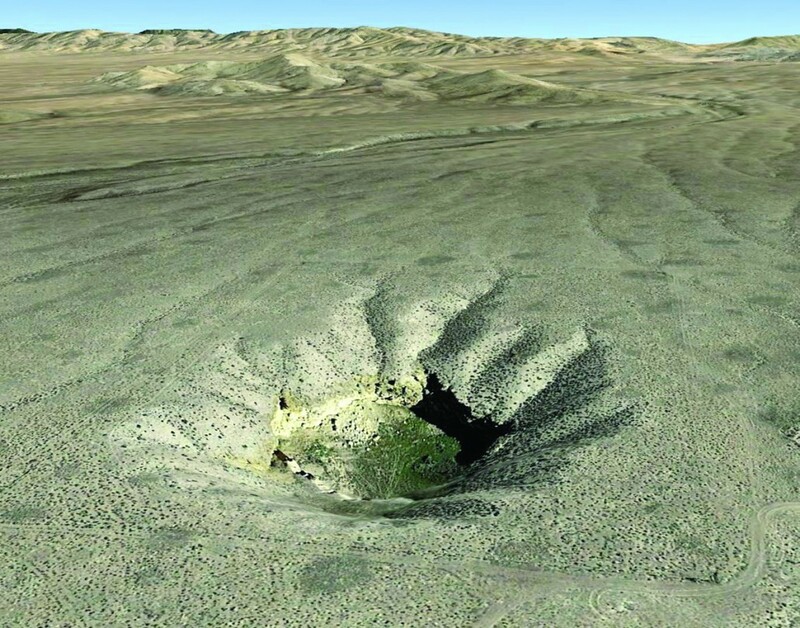 Whereas sinkholes in places like Florida and Kentucky pose a threat and sometimes swallow houses or the National Corvette Museum (a sad story, look it up), Hole-in-the-Ground is over 5 miles from Eskdale, the nearest settlement, and thus poses no risk to any structures. Even cattle are protected by an enclosing wire fence. Furthermore, the timing of this sinkhole is unknown. Collapse may have started as long ago as a million years. Hole-in-the-Ground lies within Snake Valley, which was flooded by ancient Lake Bonneville approximately 18,000 years ago during the most recent Ice Age. 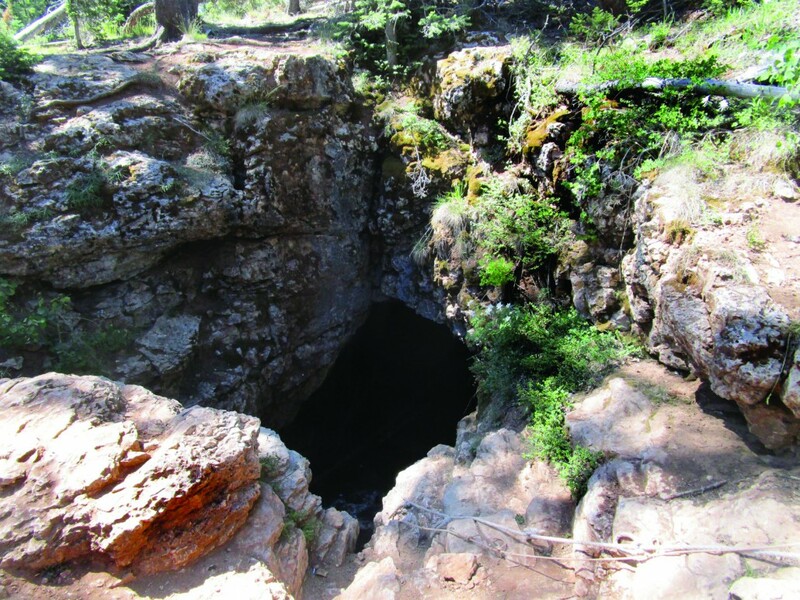 The rim of the sinkhole lies roughly 550 feet east of and 20 feet above the ancient lake’s highest shoreline, named the Bonneville Shoreline. 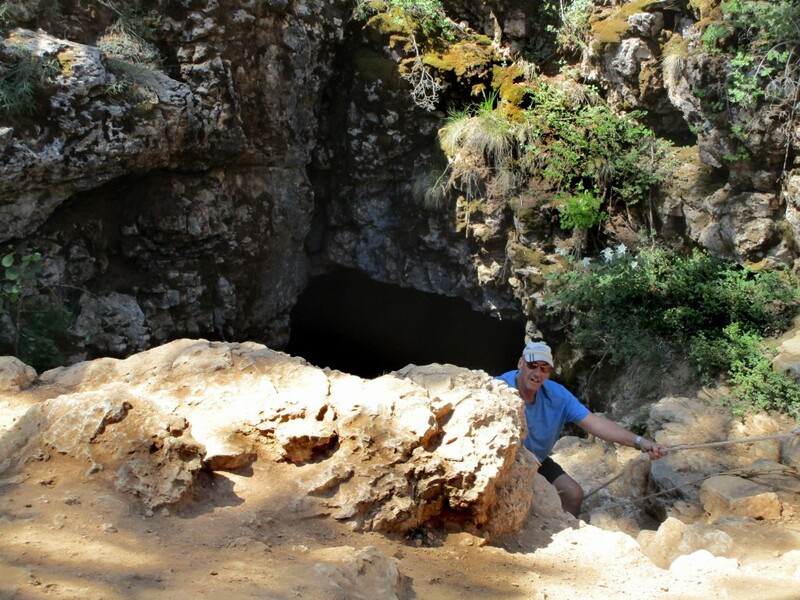 Thus, the bottom of the hole, being over 75 feet below ancient lake level, would have likely been a swimming hole filled with shallow groundwater related to the lake. Additionally, Lake Bonneville deposited impressive V-shaped sand spits, the closest of which lies less than half a mile to the southwest of the sinkhole. The sinkhole is located on land administered by the U.S. Bureau of Land Management about 6 miles northeast of the small unincorporated community of Eskdale in western Millard County. This area is remote, so please plan accordingly. Eskdale has no services; the closest gas is available in Baker, Nevada, about 15 miles to the southwest. 3.7 miles Turn RIGHT at the T-intersection. 0.6 miles Road curves to the left. 0.2 miles Continue straight/north at junction. 4.5 miles Turn RIGHT onto the unimproved two-track dirt road, which is passible in moderate to high-clearance vehicles. Proceed with caution or walk in. 0.7 miles End at sinkhole. The hole is surrounded by a wire fence, presumably to keep cattle out. The southwest corner of the fence has a stile for access. The sinkhole is located on the Hole-in-the-Ground 7.5-minute quadrangle map. Glad You Asked: What Are Ice Caves? Duck Creek Ice Cave, Kane County, a classic “cold trap” ice cave that has a closed depression and descending body and a water source of direct snowfall into the cave. Elevation 8820 feet. Photo provided by Linda Hoernke. Ice caves are caves in bedrock that host year-round ice. They differ from caves formed within ice, which are designated glacial caves. Ice caves are exceptional because they are not only scarce, but they are located far outside zones of permafrost—at low elevations (near sea level) and low latitudes (between around 30° and 70°), where they maintain a much lower average annual temperature than that of the air above. How cold temperatures persist in these spaces is a matter of cave geometry; the physical properties of air, water, and rock; the weather; and time. In Utah, ice caves are well developed in limestone caves and sinks in the Bear River Range, Uinta Mountains, and other areas such as talus slopes and lava flows. American explorer Edwin Swift Balch (1856–1927) attributed much of the cause of ice caves to The Winter’s Cold Theory, the idea that the cold of the winter perpetuates through the summer. 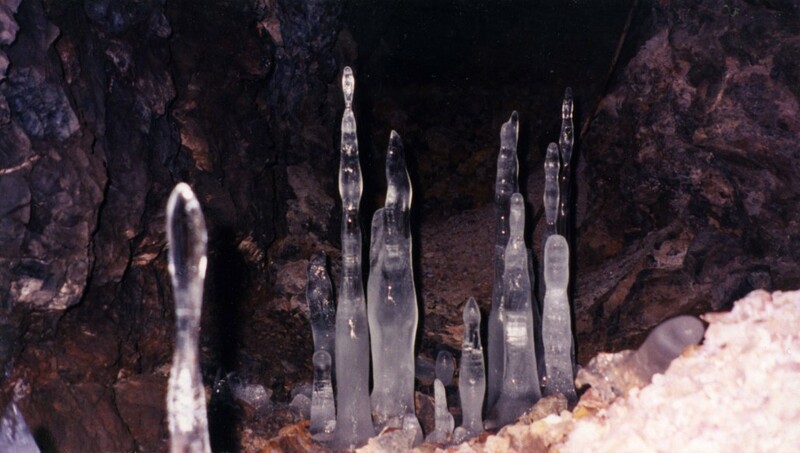 Balch took the presence of ice at the entrance of caves as evidence for the theory, noting that cold winter air is a requirement for ice cave formation and that ice had never been found beyond 200 meters (650 feet) from the entrance of a cave or deeper than 150 meters (490 feet). 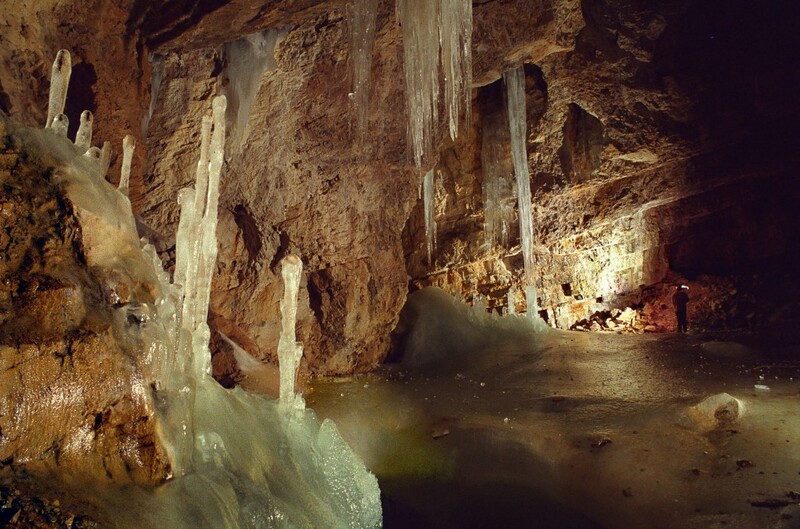 Therefore, the presence of year-round ice was due to capture and retention of cold from the previous winter rather than any natural processes operating in the cave. Ice caves are differentiated into two types by air flow and cave structure: static ice caves and dynamic ice caves. 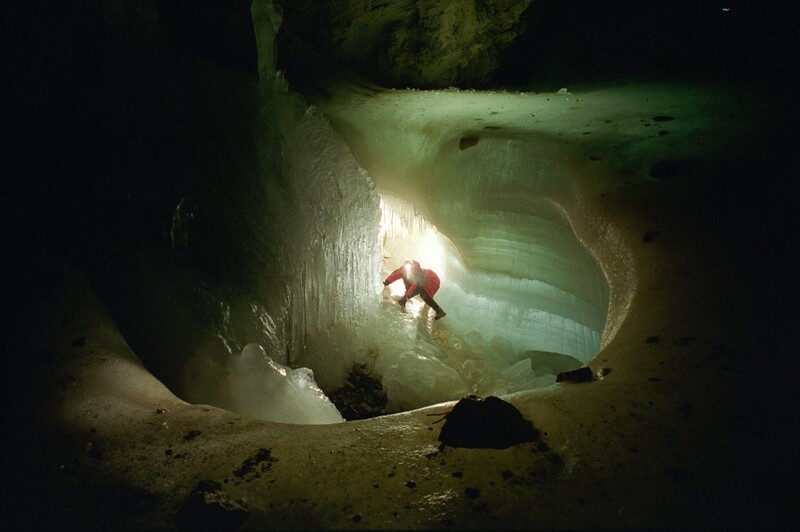 Static ice caves flood with cold air in winter and have little air circulation in the summer, with the chilly, dense air settling in and remaining stable. Entrances in these caves are higher than the downward-sloping body of the cave and are referred to as “cold sock,” “cold pocket,” or “cold trap” caves. 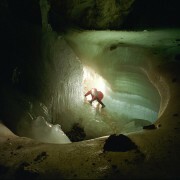 Conversely, dynamic ice caves have low entrances, an upward-sloping body, and conduits to the surface at the top of the cave. Dynamic ice caves are cooled by the “chimney effect,” where cold air is sucked up the entrance in winter as warm air exits the above conduits. Air flow is reversed in summer as cold air drains downslope out the entrance and warm air is drawn in through the higher conduits. 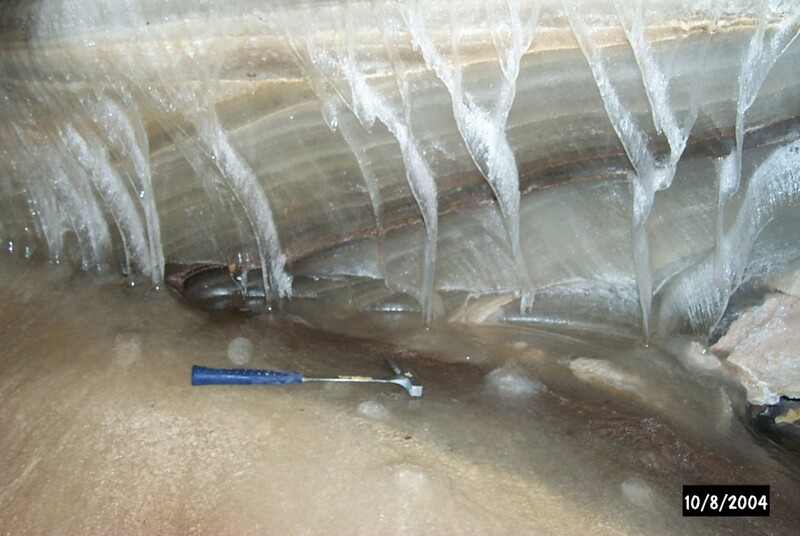 The result is a continuous annual draft of cold air at the lower section of the cave. Dynamic air circulation also produces freezing talus slopes, which can be thousands of feet below areas of permanent ice. Ice formation requires a source of water. Fractures and fissures in the bedrock allow water to seep in and freeze, or precipitation or runoff enter directly into the cave or sink. Masses of ice and snow in the cave from previous winters thwart rising temperatures in summer, as available heat energy is sunk into melting or sublimating the ice (latent heat) and warming water (specific heat) rather than warming the cave air. Once a cave builds up a sizable mass of ice and a large volume of the surrounding bedrock becomes cold, thermal inertia propels frigid temperatures through the heat of summer. Ice has been reported beneath talus slopes in the Wasatch Range and Wasatch Plateau, and in the blocky lava flows of the Black Rock Desert. 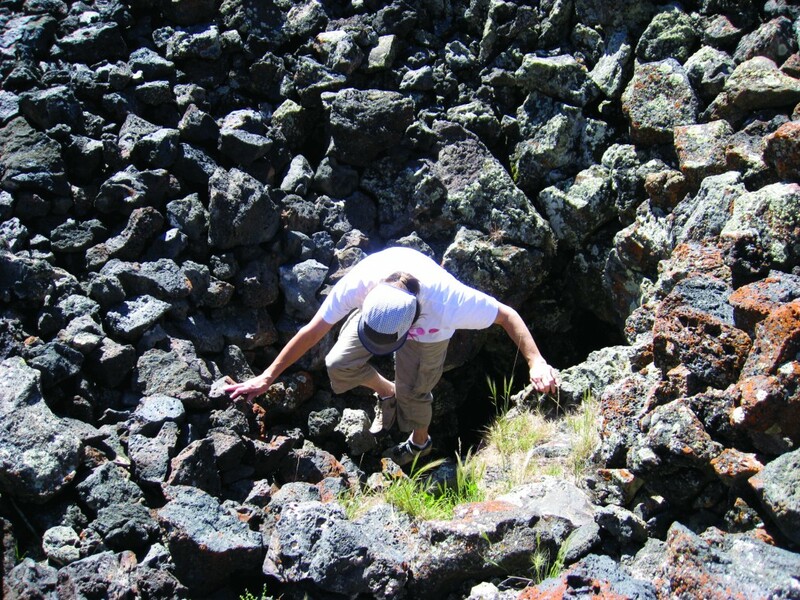 An extraordinary example is in the Ice Springs lava flow “cave” in Millard County where the annual mean air temperature is around 52°F, but the surface temperature of the dark basalt can exceed 140°F in summer. In his 1890 monograph, Grove Karl Gilbert labeled this the “Natural Ice House” and observed ice there in late September. Gilbert hypothesized the ice was a result of (1) accumulation of cold water from melting snow, (2) protection from the sun by “a heavy cover conducting heat poorly,” (3) shelter from wind, and (4) evaporation. 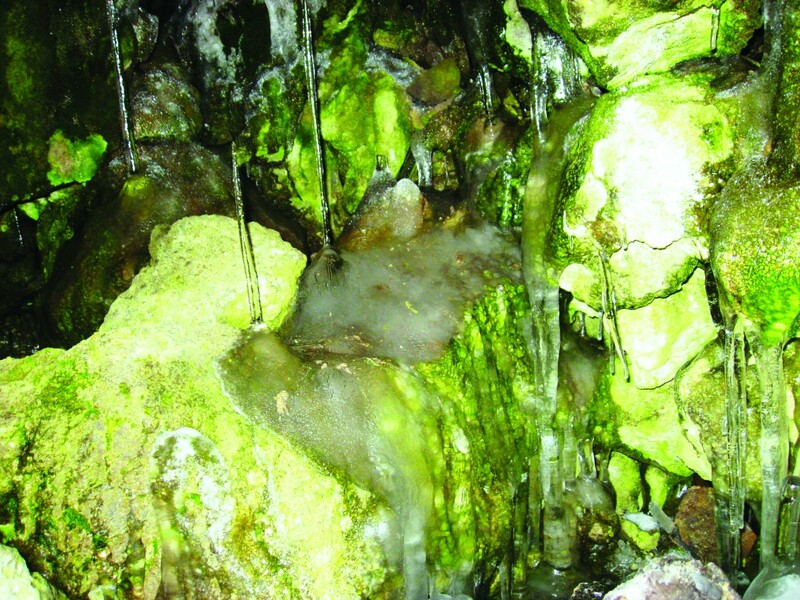 Much of the causes of the Ice Springs ice cave can be attributed to the “Balch effect,” where flattish areas with coarse, blocky materials can have ground temperatures that are more than 10°F cooler than the surrounding mineral soils. Winter air descends into the spaces between the blocks, displacing lighter, warm air. In the summer the cold air remains in the spaces between the rocks. 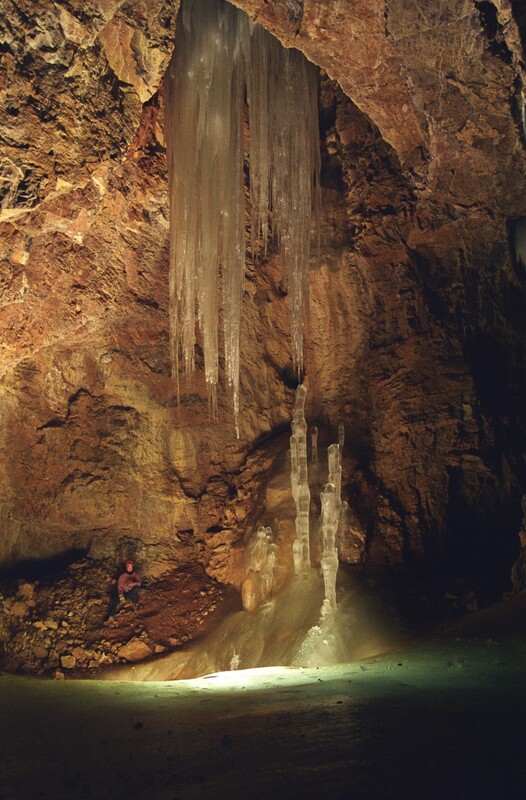 The Ice Springs cave has been without ice at times, however, as reported by the Millard County Chronicle on September 10, 1942, as dry and bare as “Mother Hubbard’s Cupboard,” with the Chronicle later reporting 36-inch-long icicles on April 22, 1948. Akin to ice in blocky fields, humans have reproduced the conditions to make ice in places where the thermometer never dips below freezing. Allahabad, India, has no frost days, but ice was created in winter under the favorable weather of a clear night (for radiative cooling) and a dry, light northwest wind (to utilize the latent heat of evaporation). 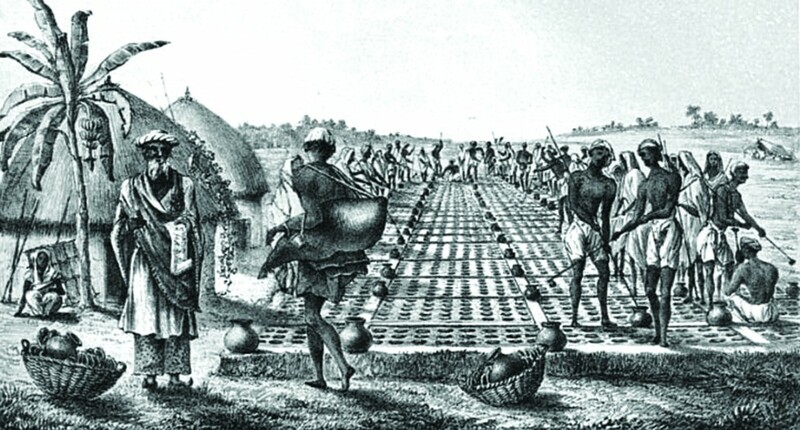 With these conditions met, small, porous earthen jars were placed on a thick bed of loose, dry rice straw for insulation in a 2-foot-deep hollow dug in the soil. The jars were filled with water, placed 6 inches below ground, and covered with mats. In the morning, thin films of ice were collected from the jars and stored in an ice house. An ice crop could be harvested when overnight temperatures dipped below 52°F. The Indian ice industry thrived in the early 19th century until supplanted by the cheaper, higher-quality New England ice, or “crystal blocks of Yankee coldness,” cut from the coastal ponds of Massachusetts and shipped to tropical ports around the world. https://geology.utah.gov/wp-content/uploads/Ice-Cave-3.jpg 1996 3000 Mackenzie Cope https://geology.utah.gov/wp-content/uploads/ugs-logo-large.png Mackenzie Cope2018-12-27 12:18:592019-03-05 12:46:42Glad You Asked: What Are Ice Caves? 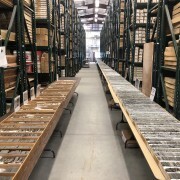 Established in 1951, the Utah Geological Survey’s Utah Core Research Center (UCRC) contains the region’s only publicly available and most complete collection of geologic core and cuttings from Utah. Think of it as a geologic library, storing inimitable archives of geologic knowledge for future generations. The current 15,000-square-foot facility was built in 1997 and presently holds core from over 1500 drill holes totaling about 400,000 feet of material (over 75 miles, roughly the distance from Salt Lake City to Logan! ), and cuttings from nearly 5000 drill holes representing over 57 million feet of subsurface data (nearly 11,000 miles, almost half way around the Earth!). Most of this material came from oil and gas wells, but some came from metal and potash exploration wells, water/geothermal wells, coal exploration wells, and many others. This collection represents about $5 billion worth of investment in Utah’s natural resources and in many cases is irreplaceable. The UCRC collection is an invaluable resource for companies looking to develop mineral and energy resources in Utah, most of which are in rural areas of the state. In 2018 alone, the UCRC hosted over 400 visitors from all over the world. Industry professionals often visit the UCRC to examine core and collect sample material for analytical testing. These examinations help them better understand their lease area, reduce exploration costs, and hopefully spur increased development. It is not uncommon for the UCRC to be the first place that a new-to-Utah petroleum company will visit before investing in Utah leases or drilling new wells. The collection is also widely used by the academic community. 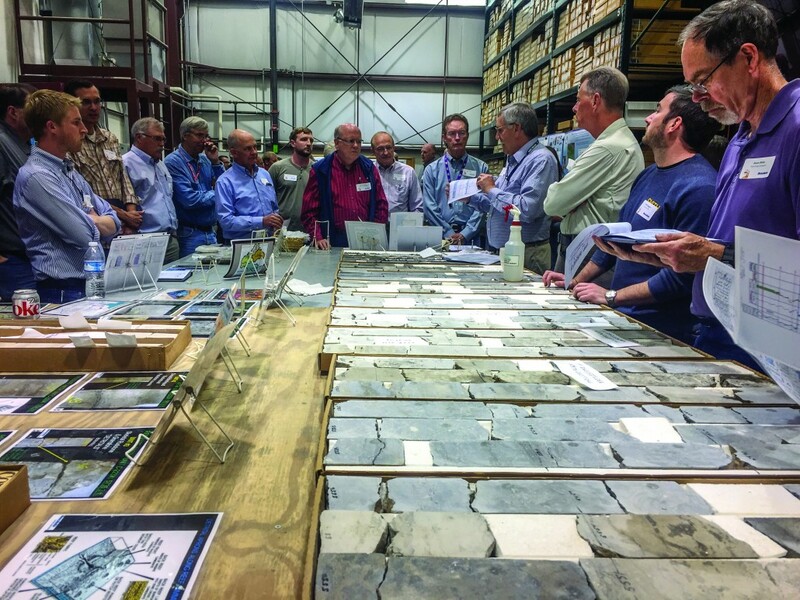 Professors and students from all over the world come to Utah to examine our core and cuttings for various research projects, the results of which are often published, leading to increased interest and understanding of Utah’s geology. Furthermore, the UCRC hosts educational workshops (20+ per year) on a wide variety of geologic topics. Outside groups will use our facility and core material to run workshops, or geologists from the UGS will organize custom educational courses for oil companies and university geology students. In the past few years, the UGS has organized workshops for geologists from several international companies including BP, ExxonMobil, Shell, ConocoPhillips, Anadarko, Total (France), Petrobras (Brazil), Equinor (Norway), and Repsol (Spain), as well as more local companies including QEP Resources, Wexpro, Newfield, Finley, Ultra, Berry, Crescent Point, Bayless, Bill Barrett, Axia, Resolute, Rose Petroleum, Fidelity, and many others. Since the downturn in oil and gas prices in late 2014, several companies have donated large quantities of core/cuttings material to the UCRC as a cost-saving measure. The most significant donation was from Resolute Energy, the former operator of Greater Aneth, Utah’s largest producing oil field located in San Juan County (see Survey Notes, v. 49, no. 2, p. 6–7). This donation consisted of core from over 120 wells, stacked on about 140 pallets requiring six semi-truck loads to deliver the material from Texas. In addition, we have recently received new cores from the Green River Formation in the Uinta Basin, the Moenkopi Formation near the San Rafael Swell, and cores from the Navajo, Entrada, and Dakota Sandstones. With all the recent donations, the UCRC warehouse is at capacity. The UGS has proposed building an additional 9000 square feet of storage space to accommodate additional donations of core and cuttings. Without access to a secure/modern core center, operators looking to offload their core might opt to dispose of it instead of donating this valuable material. It is of vital importance that the State of Utah offers an option to collect and store this important material and make it available for companies, researchers, and students to use and examine. In addition, the UCRC is in dire need of an updated and expanded core viewing area. The UCRC currently uses space in the warehouse portion of the facility. This space is not ideal for core examination or for teaching workshops because the area is too small, limiting the amount of core that can be displayed at one time and making examination difficult and inefficient; the area is not climate controlled, becoming too cold in winter and too hot in summer; and the area is within the active warehouse, making safety of guests a concern. With an improved core viewing area, we can provide a more user-friendly environment for core examination, increasing productivity and efficiency. We will also be able to host larger and more professional educational workshops, attracting more visitors to the state. 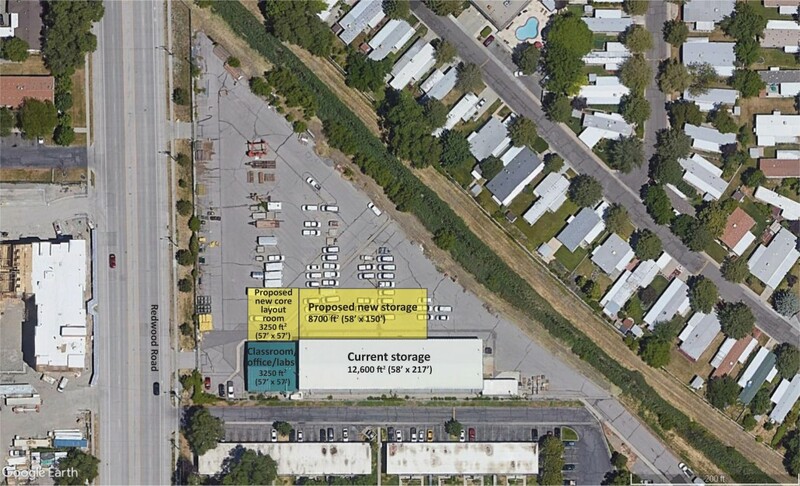 As the UGS tries to raise the funds necessary to expand and improve the UCRC, we want to emphasize that the facility is not just a warehouse full of rocks, but holds billions of dollars worth of investment in Utah’s natural resources. 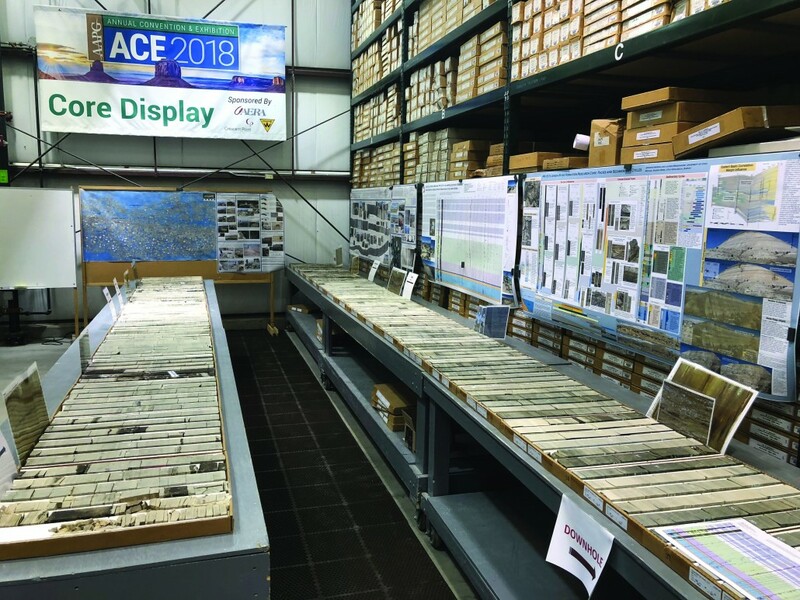 UGS geologists are dedicated to curating this important collection and fostering its beneficial use for Utah industry and geologic knowledge. If you are interested in seeing thi collection, using it for research, or teaching a core-based geologic workshop, please feel free to contact us at any time. Visit https://geology.utah.gov/?p=5230 for more information. 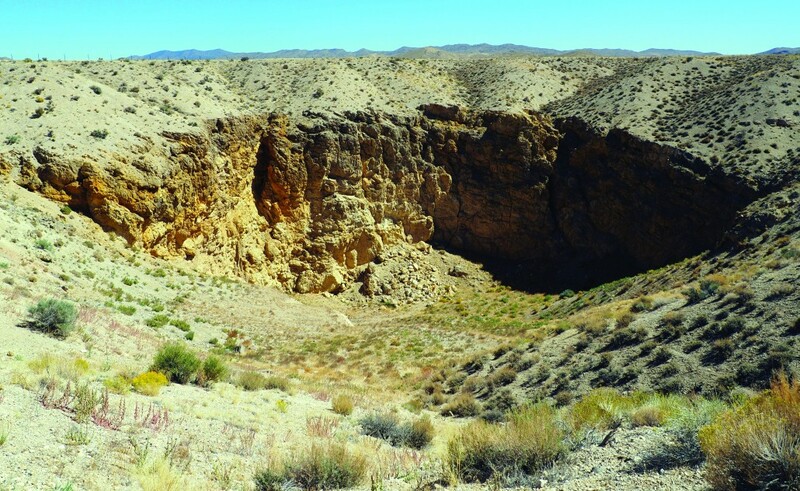 In 1972, AMAX Exploration drilled four deep core holes near the historical Cactus coppergold- molybdenum mine in the San Francisco district, Beaver County, Utah. Although these holes intersected alteration and some mineralization, they were not sufficiently encouraging at the time for AMAX to retain their property position and do further work. Rather than continue storing the core, they chose to donate it to the UGS. 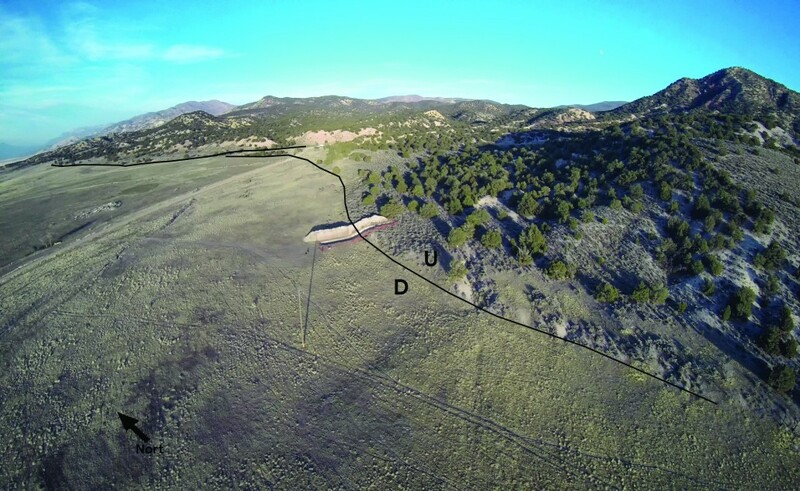 In 2016, Alderan Resources acquired a large property in the San Francisco district, including the old Cactus mine. In the course of their due diligence, they discovered that the UGS had the AMAX core. Company geologists visited the UCRC to examine these cores and took samples for new assays. They recognized that the drill core was compatible with their geologic model of the Cactus mine being part of a much larger porphyry copper system, similar to the Bingham Canyon mine. As a result of the promising analyses performed on the core housed at the UCRC, in 2017 Alderan raised about $20 million in an initial public offering, set up an office in Salt Lake City, hired some local senior staff, leased a field office in Milford, hired local support staff, and began an aggressive core drilling program. Their initial holes in 2017-18, totaling over 14,000 feet, targeted the Cactus mine area and intersected some interesting shallow mineralization. Alderan then raised another $3 million to test additional targets in the district. When new oil and gas leases are offered or if a company is looking to acquire acreage, potential buyers need to understand the geology and resources available on these lands. 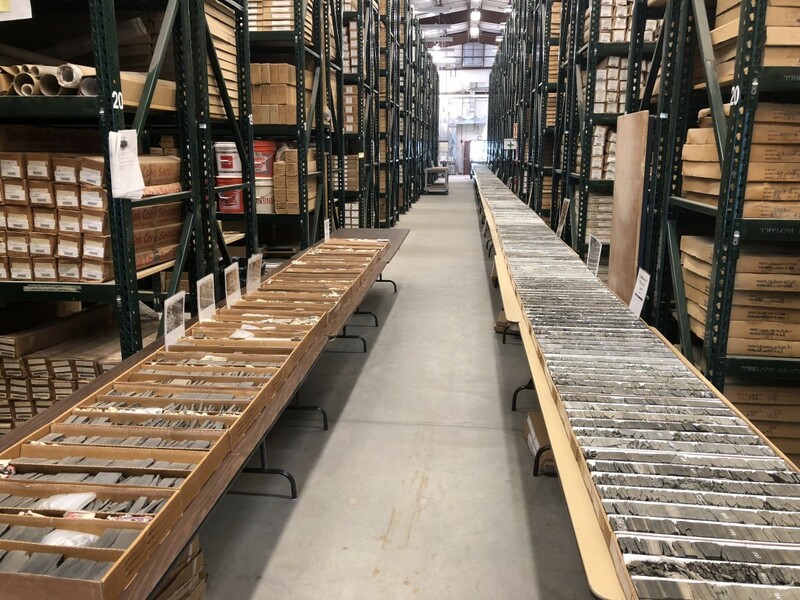 Often, prospective buyers send their geologists to the UCRC to examine core and cuttings material from the lands in question to gain a better understanding of the potential investment. For example, in spring 2018, QEP Resources decided to sell their long-held acreage in the Uinta Basin. 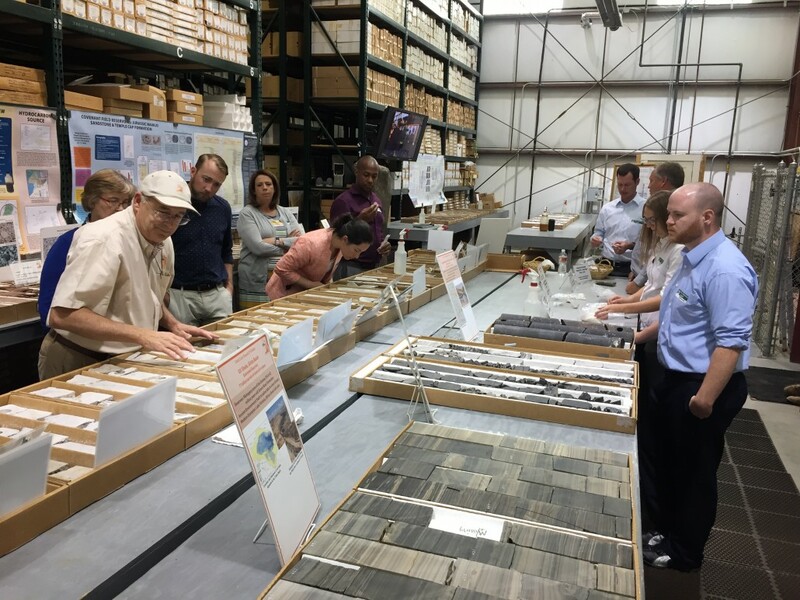 Soon after the announcement, Middle Fork Energy visited the UCRC to examine our extensive collection of cores from this area. Subsequently, in July 2018, Middle Fork announced that it had purchased QEP’s acreage for $155 million. Several times a year, companies with no current assets in Utah will visit the UCRC to examine core material; most of these companies are doing initial data gathering to determine if they want to invest in Utah resources. UGS geologists are always on hand and available to help educate company representatives on Utah’s natural resource potential. The Levan and Fayette segments of the Wasatch fault zone (WFZ) are located in central Utah, in Juab and Sanpete Counties. Our trench sites lie along State Route 28; Skinner Peaks South is approximately 11 miles south of Levan and Hells Kitchen South is approximately 6 miles north of Fayette. Traces of the WFZ are shown in red, and the Levan-Fayette segment boundary is indicated by the gray line. The Wasatch fault zone (WFZ), Utah’s longest and most active fault, has long been known to be a serious earthquake threat to the Wasatch Front region. In 1883, G.K. Gilbert, the pioneer and father of Utah geology, wrote a letter to the Salt Lake Daily Tribune warning residents of earthquake risk in Utah. 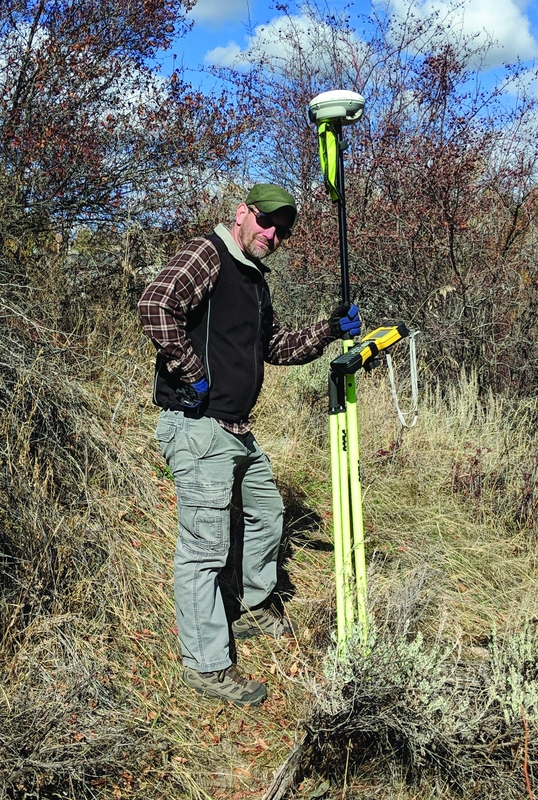 Since then, great strides have been made to study and understand earthquakes along this major fault system to help reduce earthquake risk along the Wasatch Front. Most of this work has been conducted on the five central segments of the WFZ, leaving the northern and southern end segments relatively unstudied. An earthquake forecast, or probability model, for the WFZ was published in 2016 by the Working Group on Utah Earthquake Probabilities, but due to a lack of earthquake timing data, the end segments could not be characterized as rigorously as the central segments. This lack of data on the end segments hinders our ability to accurately model and forecast earthquakes on the entire WFZ. Both the Levan and Fayette segments on the southern end of the WFZ show evidence for generating large, surface-faulting earthquakes in the Holocene time period (about the past 12,000 years). However, previous paleoseismic (the geologic study of past earthquakes) research on both segments is limited. In 2015, Utah Geological Survey (UGS) geologists remapped the segments in great detail using new high-resolution digital topographic data. This new mapping has allowed us to identify previously unknown and unmapped traces of faults along these segments, and helped us in selecting sites for paleoseismic fault trenching investigations. Investigations conducted in 1991 and again in 2008 on a natural exposure of the fault exposed by a stream cut on the Levan segment provided a timing estimate for the most recent large earthquake that occured on that segment (approximately 1000 years ago). 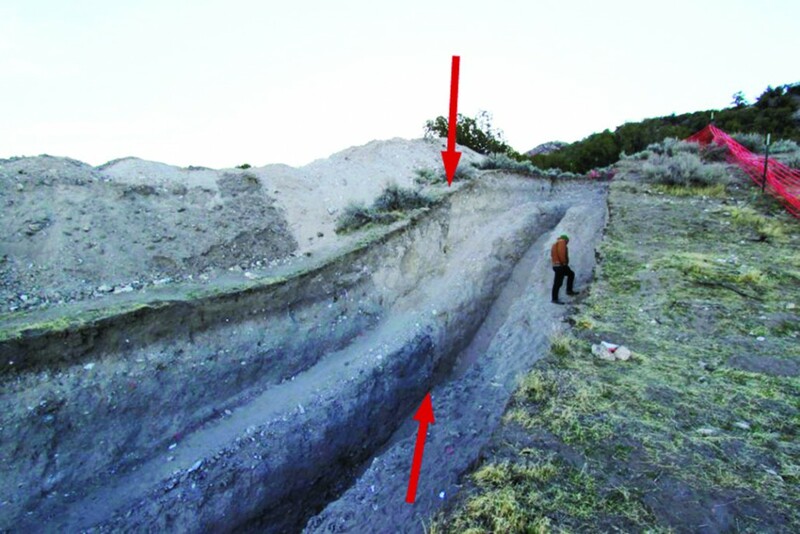 A fault trenching investigation on the south end of the Levan segment, also in 1991, produced data consistent with a large earthquake around 1000 years ago, but was unable to document the timing of any earlier earthquakes. Finally, data collected by creating topographic profiles across Levan- and Fayette-segment fault scarps has provided insights into earthquake rupture on both segments. Despite this past work, many unanswered questions remain about earthquake activity on these southernmost segments of the WFZ: How often do large earthquakes occur on these segments and how episodic or random are they? Do earthquakes rupture only the Levan segment or Fayette segment, or do they rupture and spill-over from one segment to the other? What role does local geology play in faulting on these segments? How does the nature of faulting on these segments compare to faulting on the central segments of the WFZ (e.g., the Salt Lake City and Provo segments)? To attempt to answer these questions and more the UGS, aided by the U.S. Geological Survey (USGS), conducted a fault trenching investigation of prehistoric surface-faulting earthquakes on the Levan and Fayette segments in October of 2017. We excavated one trench at the Skinner Peaks South site on the Levan segment and one trench at the Hells Kitchen South site on the Fayette segment. The excavations were open for about a month while we worked to collect data and map the exposures. At the Skinner Peaks South site, we excavated a trench across a 10- to 13-foot-high scarp. 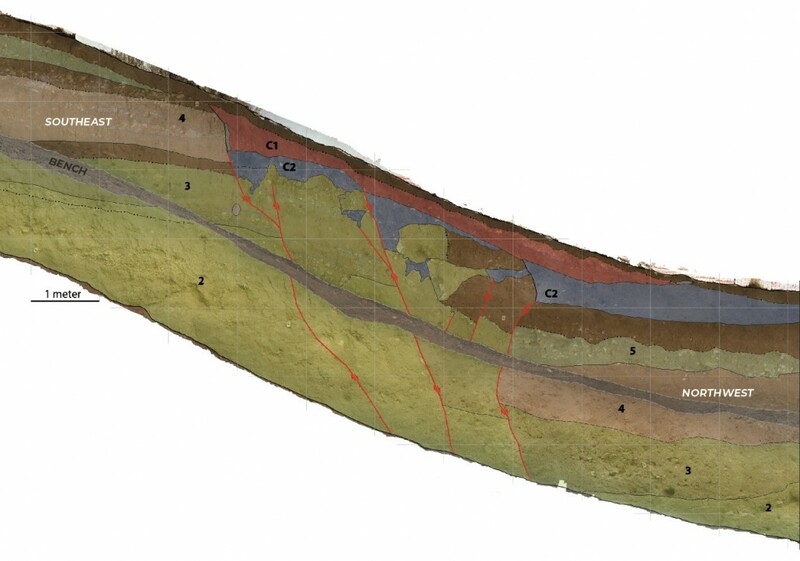 We mapped five stratigraphic units in the trench, including highly weathered volcanic bedrock in the bottom of the trench and sandy alluvial-fan gravels containing several prominent buried soil horizons. At the Hells Kitchen South site, we excavated a trench across a 3- to 6-foot high scarp. This trench exposed mostly coarse-grained alluvial-fan deposits and a loess (wind-blown fine sand) deposit at the bottom of the trench, and we mapped four stratigraphic units. We map the trench-wall exposures on high-resolution photomosaic images in the field, and then digitize our mapping back in the office later. 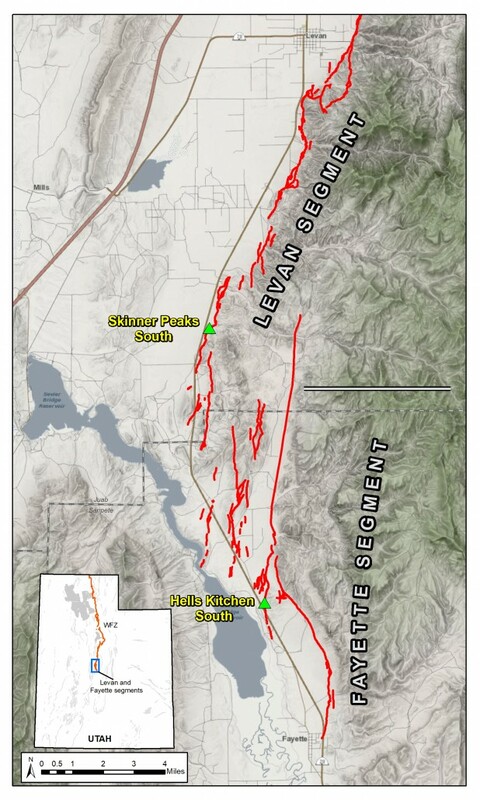 Our preliminary findings include evidence for two surface-rupturing earthquakes at the Skinner Peaks South site and one surface-rupturing earthquake at the Hells Kitchen South site. We collected 20 samples for radiocarbon (14C) dating and= 15 samples for optically stimulated luminescence (OSL) dating. Combined with our stratigraphic mapping, the dating results will be used to develop earthquake timing models and recurrence intervals for the Levan and Fayette segments. Our final report will be published in the Paleoseismology of Utah Series, a UGS series of reports pertaining to the study of past earthquakes in Utah. Eventually, our results will be incorporated into the USGS’s National Seismic Hazard Maps, which are used by local engineers and architects to adequately plan and design for development and reduce earthquake risk along the Wasatch Front region and elsewhere. Studying the end segments of the WFZ is critical to helping us understand and forecast large earthquakes on the entire fault. Through this investigation and others, the UGS is working to fill gaps in earthquake data along the WFZ. We have recently completed detailed fault mapping for the entire fault zone (see Survey Notes v. 49, no. 3, p. 1–3). We are also working to secure funding to conduct a similar investigation on the northern end segments, specifically the Clarkston Mountain and Malad City segments in northern Utah and southern Idaho. These investigations will help Utahns better understand the hazard from large earthquakes on the WFZ and help us strengthen our earthquake resiliency. Spring Creek Road landslide headscarp, showing evacuated homes at the top of the landslide. The darkened, wet areas are three springs at the base of the headscarp. Photo taken by Jon West, Davis County Sheriff’s Office, June 26, 2018. Ben Erickson is a Project Geologist in the Geologic Hazards Program who joined the Utah Geological Survey in 2011. He is a Utah native and has a B.S. in Earth Science from Utah Valley University and a M.S. degree in Geological Engineering from the University of Utah. Ben works to share knowledge of geologic hazards through mapping and working with communities. His role in emergency response ranges from logging digital data to explaining geological hazard conditions to local communities, civic leaders, and the media. The Utah Geological Survey (UGS) Geologic Hazards Program investigates and researches landslides and other geologic hazards in Utah. Our applied research includes analyzing landslide behavior and developing models that can be used to determine future landslide activity to assist at-risk communities. 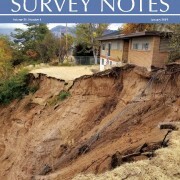 Through research of previous landslides we know the general factors affecting landslide dynamics in Utah. These factors include the season, the type of rock or soil, seasonal snowpack and runoff, and land modification. 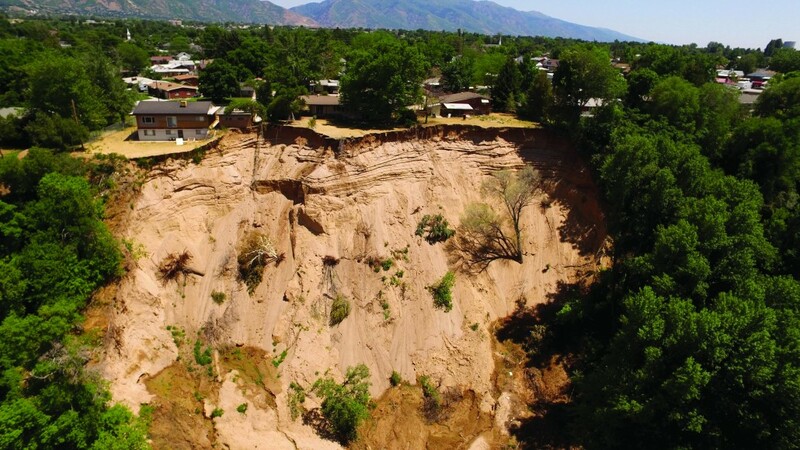 These factors typically allow a geologist to anticipate landslide behavior, but in the case of the Spring Creek Road landslide in northern Utah, there was little indication of what was to come. Located 1000 feet east of the Riverdale City offices, the Spring Creek Road landslide, a reactivation of a pre existing landslide, started moving on November 19, 2017. 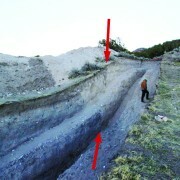 The landslide reactivated on a steep, sandy bluff formed by the Weber River cutting down into the sediments of ancient Lake Bonneville. Several horse pastures are present at the base of the bluff, one of which was severely impacted by the landslide. The pasture owners were present and vividly recount the event: “fast and loud, snapping trees on its way down.” The landslide quickly flowed and covered Spring Creek Road, narrowly missing buildings and machinery. 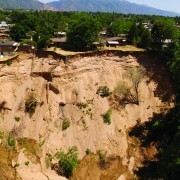 The pasture, which was a Christmas tree staging area at the time, was threatened by continued landsliding and sediment buildup. The landslide cut off access to a home on Spring Creek Road and stopped 120 feet short of a five-track Union Pacific rail yard. The quickly moving landslide and long runout was due, primarily, to abundant= groundwater, which caused it to flow out over 250 feet from the base of the bluff, classifying the landslide as a rapid earthflow. The slide continued to flow in subsequent events for several months, but activity slowed through the summer of 2018. When it first reactivated, the landslide was about 620 feet long and 160 feet wide. Homes at the top of the bluff were deemed unsafe as the slide slowly carved away at the backyards upslope. Riverdale City issued mandatory evacuation orders for three homes and a voluntary evacuation order for one. As the landslide headscarp continued to recede upslope, all four houses were permanently evacuated. Following initial landslide movement, water flowing from springs near the base of the cliff face continued to erode the lower deposit to form a smooth alluvial fan. In addition, the steep headscarp was being undercut by spring water flow carrying sediment away and causing further landslide activity, driving the cliff face closer to the evacuated homes, and preventing the slope from grading into a less steep, more stable surface. Flow from the springs also created a stream channel through the pasture and continues to periodically flood the area. The stream channel changes course as large headscarp blocks fall into the deposit. The unpredictable stream channel location has prevented the pasture owners from directing the water away from their structures, resulting in sediment deposition in and around their pasture and buildings that ranges from about 5 feet thick around the buildings to 10–15 feet thick near the base of the bluff. 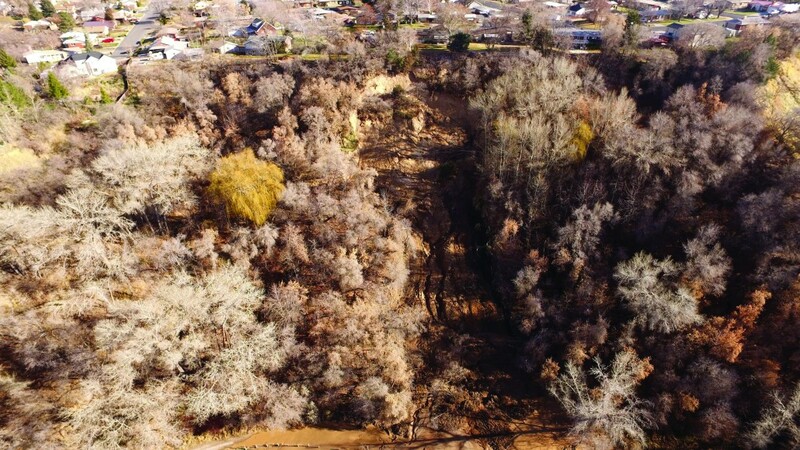 The Union Pacific Railroad added 4 feet of fill on their access road between their tracks and the landslide toe, preventing inundation of the tracks. 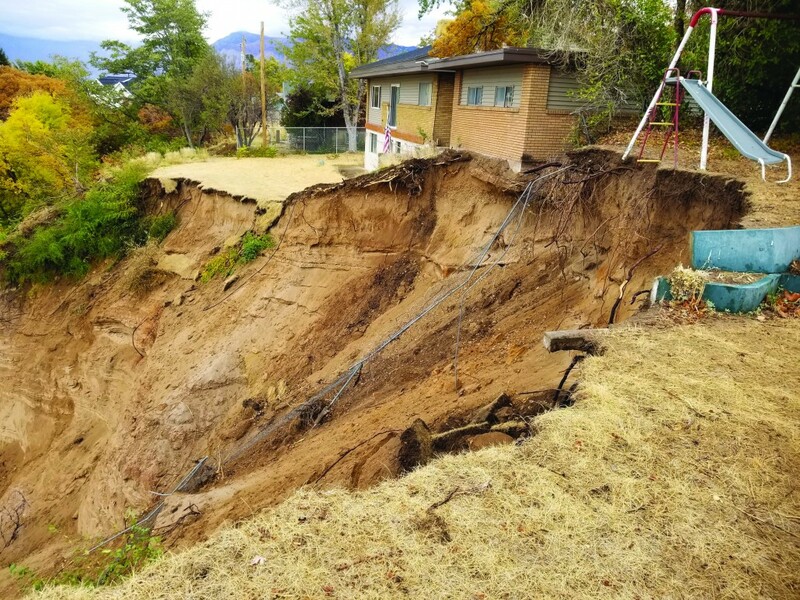 At the end of summer 2018, the landslide deposit enlarged to about 690 feet long and 260 feet wide, and the headscarp widened 100 feet to the north and south and moved 70 feet toward the homes, undercutting a garage. 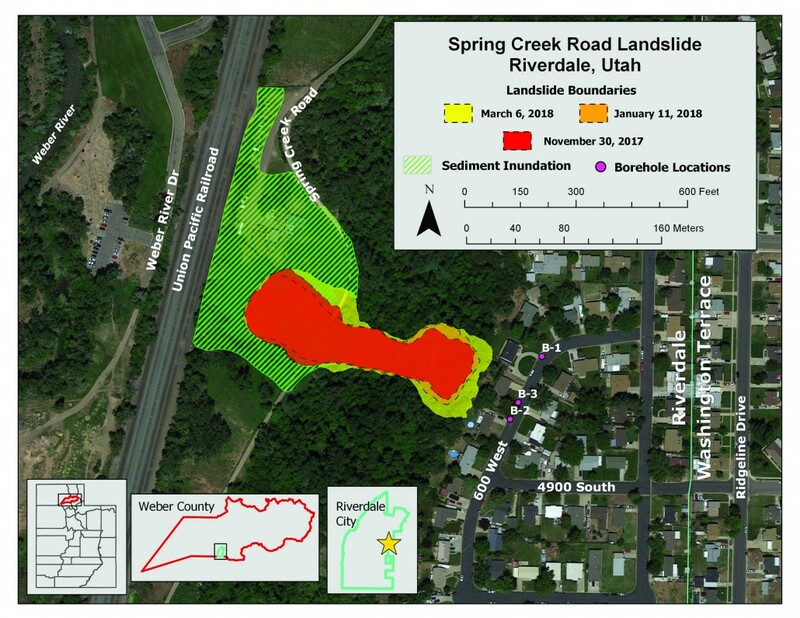 At first, the Spring Creek Road landslide did not appear to have any of the indicators typically observed in Utah landslides. 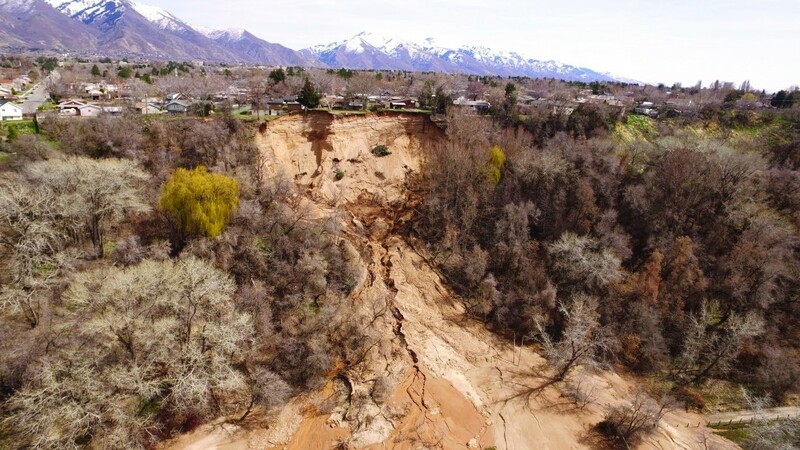 The rapid landslide movement occurred in late November, a time when little surface water or precipitation is typically available to influence groundwater levels. 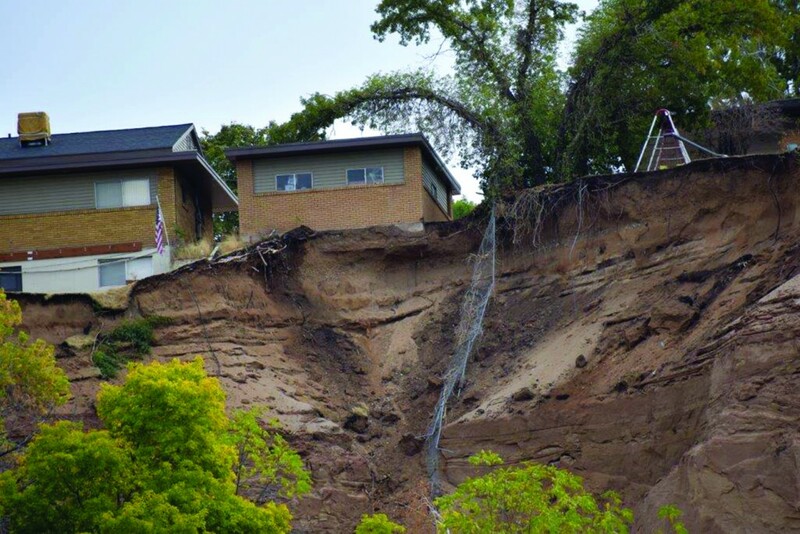 The landslide impacted a well-established, 60-year-old residential development that had no recent modifications made to the bluff. The slide continued to enlarge at about the same rate for several months after initial movement. These factors seem to indicate an unusual landslide behavior; however, with further investigation, the behavior became better understood. The closer look started with the bluff. The bluff is composed of layers of impermeable clay at the base overlain by sand and silt. The sediments were deposited in ancient Lake Bonneville approximately 12,000 to 24,000 years ago as part of a delta that formed at the mouth of Weber Canyon. The delta was over 200 feet thick at the Spring Creek Road landslide site. After Lake Bonneville receded, the Weber River eroded through the delta carving a bluff-bounded floodplain in which much of Riverdale City now resides. The bluff is shown on geologic maps as a mass-movement deposit where several prehistoric and historical landslides are identified. Aerial imagery indicates activity of some of these landslides as recently as a few years ago. Imagery from June 17, 2017, shows an approximately 20-foot-wide by 70-foot long area of bare soil on the vegetation-covered steep bluff. The bare soil probably indicates the initial landslide reactivation. The addition of water to the steep bluff is the key reactivation factor in this landslide’s movement. Water is often the driving force or trigger of a landslide. In Utah, excess water is abundant in springs and creeks during snowpack runoff. This means that spring is an active season for landslides, predominantly during high-snowpack and rapid-runoff years. Summer monsoonal rain can also provide excess water, but storms are localized, short-lived, and generally do not provide enough time and water to saturate and mobilize large landslides like the Spring Creek Road landslide. This landslide reactivated with rapid movement in late fall. Groundwater influence, as opposed to seasonal precipitation, is the critical factor for the Spring Creek Road landslide. 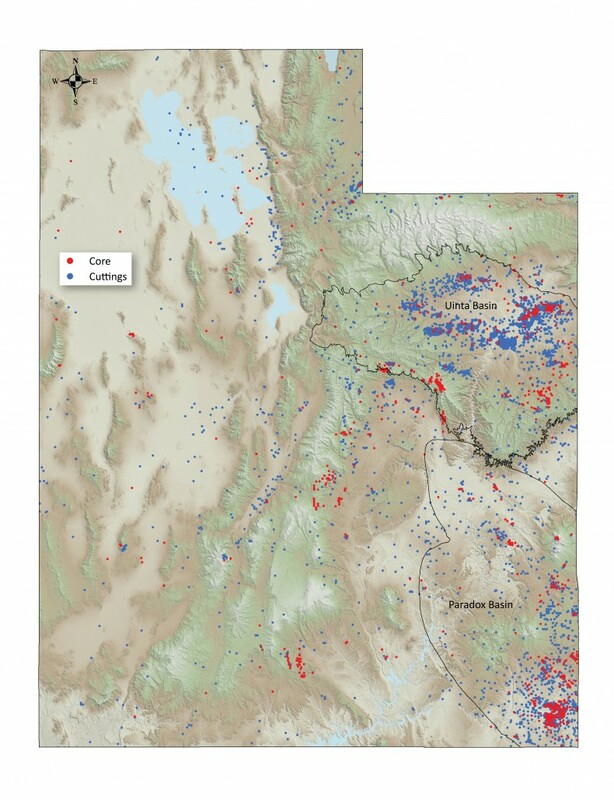 Groundwater slowly travels from the Wasatch Range to Great Salt Lake. To determine local groundwater levels, Riverdale City drilled three observation wells east of the landslide in early spring of 2018. The UGS placed sensors in two of the wells to record water levels periodically throughout the day. In other places, groundwaterlevel spikes related to landscape watering have been linked to landslide activity. At Spring Creek Road, however, the observed groundwater levels slowly declined and there is no indication of a groundwater seasonal increase due to landscape irrigation. A delay in summer landscape watering spikes is possible and could be detected by continued monitoring. Three of the homes affected by the Spring Creek Road landslide were built in 1960 and one in 1963, decades before formal geologic and geotechnical engineering planning and construction ordinances were adopted in Utah. However, future planning for this area and similar geologic areas needs to take advantage of available resources to reduce the risk associated with this type of landslide and other geologic hazards. The 1988 slope-failure inventory map produced by Weber County and the 2004 geologic map of the Ogden 7.5-minute quadrangle published by the UGS show this landslide is within an area of previously mapped landslides along the bluff. These map resources can help established communities and developers evaluate risk and plan for disasters such as the 2017 landslide. The UGS continues to study and monitor the Spring Creek Road landslide and provide information and advice to Riverdale City as requested. The active springs at the base of the landslide scarp continue to create a high risk for landslide activity and resulting damage to land and infrastructure.